Successfully Added Radio Control Amphibious Monster Toy RC Truck (110V) to your Shopping Cart. Radio Control Amphibious Monster Toy RC Truck for hours of all terrain fun! With its powerful torque and head-turning metallic orange exterior, this monster truck looks like a bolt of lightning as it blows by the competition. Featuring a dual thumb stick remote controller with two action buttons, give the left one a press and this machine comes to life with realistic ignition and idling sounds. Give the right one a press and the booming sound system which takes up the entire flatbed kicks in along with a fantastic light show which tells people you've arrived and you're ready to demolish! Up front, this monster truck sports gigantic front grills to efficiently absorb impact shock as well as bulldoze the competition off the track. What's more an extra long car antenna has been added for more responsive signal reception. This truckers dream come true has everything you would come to expect from an astounding monster truck like enormous studded tires that are as big as the truck body itself. Big and heavy, the wheels chew up the earth and drive over the other cars. On the back is a hard plastic stabilizer bar which also serves as a wheelie stand. Watch and be amazed as this beast of a monster truck does donuts (spinning 360 degrees over and over) with its front lamps pointing straight up in the air. This baby is so hot it's smoking. So take it into the water to cool down! The underside is sealed to resemble a boat, while two powerful turbines propel the truck making this RC vehicle an unstoppable force in land or water. As always, this wonderful radio controlled toy is offered to you at a low wholesale price. From the leader in unique direct from China electronic products, Chinavasion. The default charger for this product is for 110V. If you need a 220V power adapter then order CVGN-T11-220V. 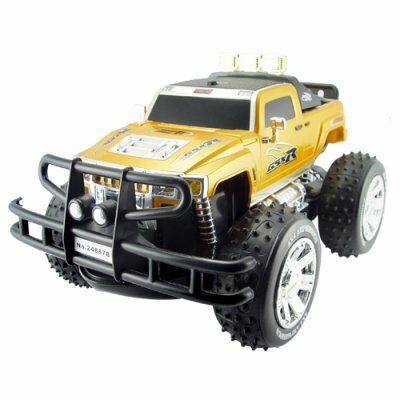 Can this RC monster truck be used outdoors? YES. Can it be used outdoors after it has rained? YES. It is an amphibious vehicle and has an underside which protects it from water. It should NOT however be used while it is raining, or else water could get into the battery housing on the top of the truck and ruin the inner circuitry. Does the antenna of the RC remote have to be fully extended to get the most out of operating range? Yes, though you can adjust the antenna to suit how you want to operate the RC vehicle since there is not always a need to fully extend the antenna.